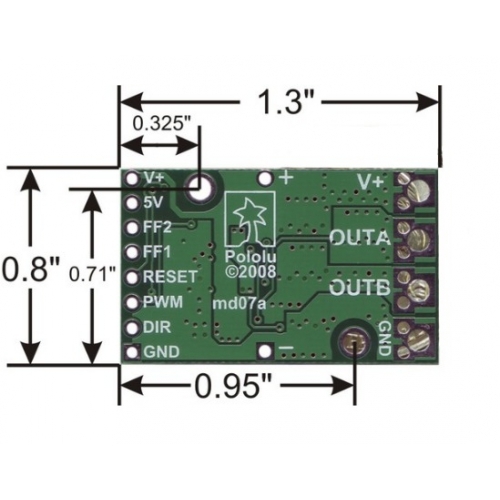 The Pololu high-power motor driver is a discrete MOSFET H-bridge designed to drive large DC brushed motors. The H-bridge is made up of one N-channel MOSFET per leg, and most of the board’s performance is determined by these MOSFETs (the rest of the board contains the circuitry to take user inputs and control the MOSFETs). The absolute maximum voltage for this motor driver is 40 V, and higher voltages can permanently destroy the motor driver. 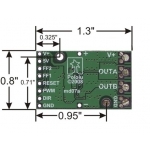 Under normal operating conditions, ripple voltage on the supply line can raise the maximum voltage to more than the average or intended voltage, so a safe maximum voltage is approximately 34 V.
The versatility of this driver makes it suitable for a large range of currents and voltages: it can deliver up to 12 A of continuous current with a board size of only 1.3" by 0.8" and no required heat sink. With the addition of a heat sink, it can drive a motor with up to about 17 A of continuous current. 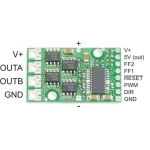 The module offers a simple interface that requires as little as two I/O lines while allowing for both sign-magnitude and locked-antiphase operation. Integrated detection of various short-circuit conditions protects against common causes of catastrophic failure; however, please note that the board does not include reverse power protection or any over-current or over-temperature protection. 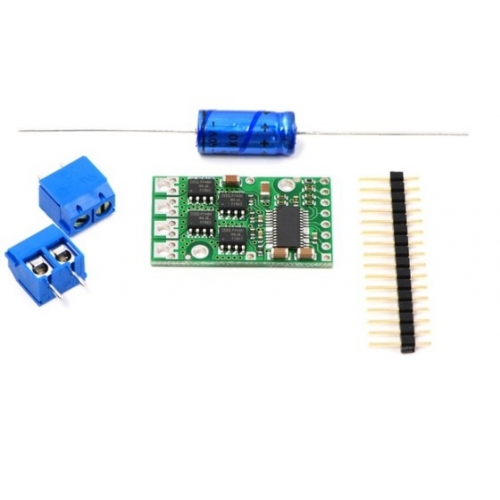 The logic connections are designed to interface with 5V systems (5.5 V max); the minimum high input signal threshold is 3.5 V, so we do not recommend connecting this device directly to a 3.3 V controller. In a typical configuration, only PWM and DIR are required. The two fault flag pins (FF1 and FF2) can be monitored to detect problems (see the Fault Flag Table below for more details). 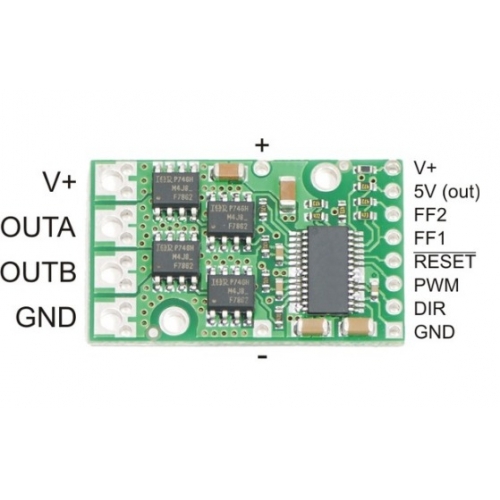 The RESET pin, when held low, puts the driver into a low-power sleep mode and clears any latched fault flags. The V+ pin on the logic side of the board gives you access to monitor the motor’s power supply (it should not be used for high current). 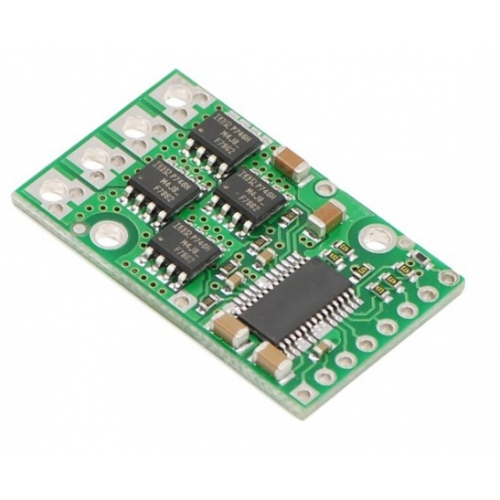 The board also provides a regulated 5 V pin which can provide a few milliamps (this is typically insufficient for a whole control circuit but can be useful as a reference or for very low-power microcontrollers). V+ This is the main 5.5 – 30 V motor power supply connection, which should typically be made to the larger V+ pad. The smaller V+ pad along the long side of the board is intended for a power supply capacitor, and the smaller V+ pad on the logic side of the board gives you access to monitor the motor’s power supply (it should not be used for high current). RESET HIGH The reset pin, when pulled low, puts the board into a low-power sleep mode and clears any latched fault flags. A 16-pin straight breakaway male header, one 100 uF axial capacitor, and two 2-pin 5mm terminal blocks are included with each motor driver. Connecting a large capacitor across the power supply is recommended; one way to do it is between the '+' and '-' holes, as shown below. The two mounting holes are intended to be used with #2 screws (not included). The motor driver can handle large current spikes for short durations (e.g. 100 A for a few milliseconds). The peak ratings are for quick transients (e.g. when a motor is first turned on), and the continuous rating of 12 A is dependent on various conditions, such as the ambient temperature. The actual current you can deliver will depend on how well you can keep the motor driver cool. The driver’s printed circuit board is designed to draw heat out of the MOSFETs, but performance can be improved by adding a heat sink. 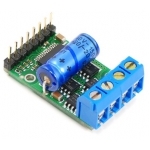 With a heat sink the motor driver can be run at up to 17 A of continuous current. For more information on power dissipation see the data sheet for the MOSFETs on the Resources tab.